In ten years, San Francisco's Mint Plaza cafe has garnered a reputation that feels almost mythical. While we won't discount its location in the historic 1912 Provident Loan Association building, or the row of coffee siphons that, to the unfamiliar, look like the accoutrements of a mad scientist, we think this allure is rooted in a tradition of coffee excellence. Blue Bottlers have worked hard to ensure this reputation is well-earned. Over the years, the Mint's five-light siphon bar has become an institution in the city's bustling SOMA neighborhood. 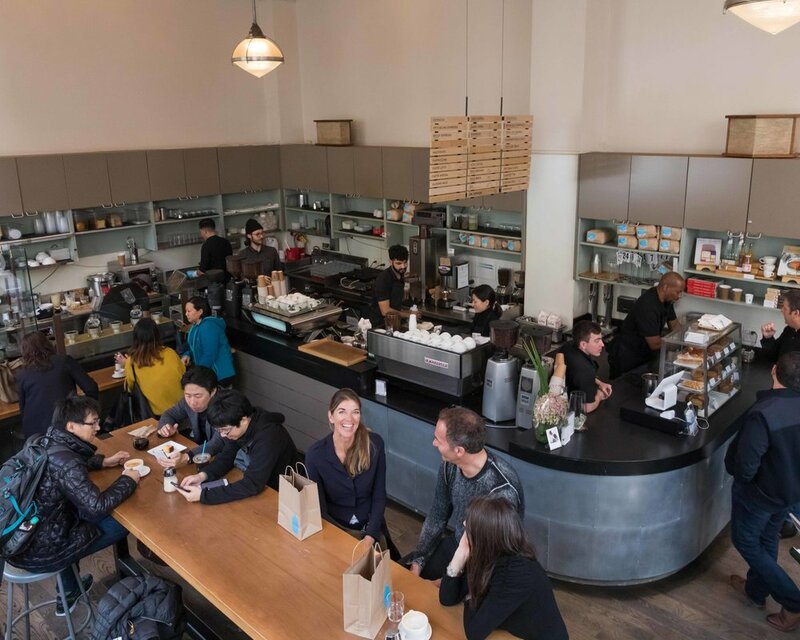 With its full breakfast and lunch menu, and, of course, Blue Bottle's espresso, blend, and single origin coffees, guests have come to rely on the Mint as an oasis of deliciousness and hospitality in their busy day. "The first time I went there, I just got this feeling that the people there cared about each other, and the guests, too," says Bay Area Trainer Emily Olson. She describes the experience of welcome, beauty, and coffee expertise as, "nothing short of dreamy." Cafe Leader Johnny West, who has been at the Mint since July 2014, speaks just as highly of his team members. As he sees it, the Mint is a space where curiosity and kindness meets a passion for coffee. "Though many of the crew have come and gone since I started here, I continue to work alongside a handful of folks who have preceded my time here, including Barista Celia Vasquez, who has been here for nine years!" says Johnny. "I've also watched many Mintees go on to do bigger and better things at Blue Bottle, including roasting, training, and helping open our newest markets across the world." Overwhelmed by its physical beauty and heartfelt warmth, most of us, upon entering the Mint, have the same reaction that Nate does: "Am I even worthy of being in such a special place?" he asks. Perhaps not, but all are welcome, nevertheless.